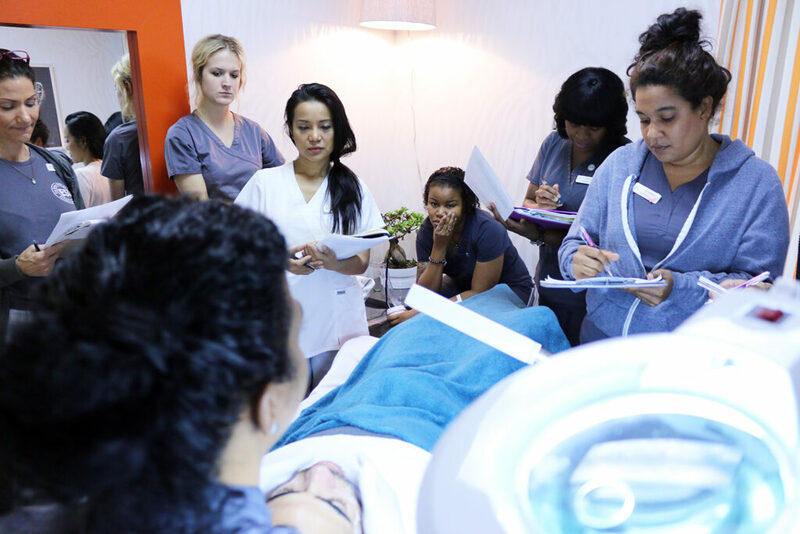 The objective of the Esthetician program is to develop in the student the practical skills, theoretical knowledge and professional attitudes necessary for success in the Esthetic industry and profession. To provide a content-rich curriculum that meets State, National and International requirements in theory, lab, and clinical experience, and that prepares students to confidently enter the industry ready to work. To train students to critically think as they assess and address the individual needs of each client. The goal of this program is to qualify and equip the student with the tools, experience and confidence necessary to pass the State of Georgia Licensing Examination and to assure the student is the top candidate for future employers or business opportunities. ESI offers an exciting the 1000 hour esthetician program for licensure where you can become an esthetician technician in 9- 13 months. The ESI dynamic esthetician program is facilitated in the state of the art school and spa (student clinic). 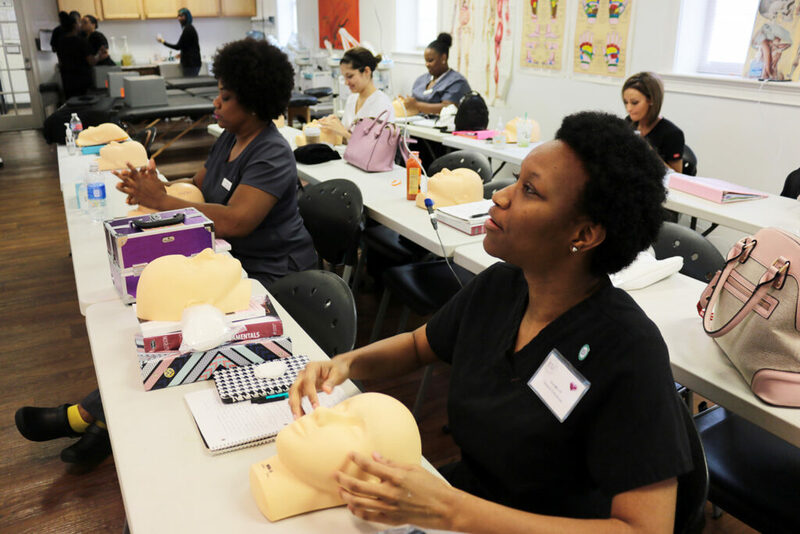 The Elaine Sterling Institute offers the 1000-hour esthetician program for licensure in the state of Georgia. Our Institute has the latest spa equipment available, making ESI renowned for combining European standards with American Science. At the Elaine Sterling Institute, we try our best to accommodate individuals from all walks of life, and this often includes a multitude of schedules. We offer a series of programs to choose from in order to suit your scheduling needs. ESI offers tuition payment plans and offer federal financial aid. Tuition and registration payments can be made online in our tuition payment section of our website. More information can be found about financial aid and tuition on our Financial Aid page. Students will receive an ESI Hoodie, an equipment bag, Samsung tablet, Makeup Kit and an esthetician kit with all the necessary instruments and materials to perform the required services. After a student completes 1000 hours, services, exams and fulfills all financial obligations to the school, a certificate will be awarded. Completion time depends on the schedule the student chooses and attends regularly. Based on a Full Time schedule, the normal time frame of completion would be 9 months. The Part Time Day schedule time frame of completion would be 12 months. The Part Time Evening Schedule time frame of completion would be 14 months. At the Elaine Sterling Institute, our expansive curriculum offers a multitude of skills and certifications. The lists below breakdown exactly what skills and certifications you can achieve, and the level requirements show our curriculum for each level of our programs. Upon completion of the Esthetician Program, students will complete 3 levels. The students are about to embark on a journey into a career ripe with opportunity for success and personal satisfaction. The need for professional estheticians continues to grow in new and exciting ways. As a therapist you represent both your profession and your employer and, when you consult with clients they are placing their confidence in you as a professional. Being a professional in the skincare business starts on day one of class at The Elaine Sterling Institute. Anatomy and physiology of the human body from cells to body systems. Eleven body systems will be studied to understand how the human body functions. Cytology and the integumentary system will be studied thoroughly to assure detailed and vast knowledge of the core component and basis of the skincare profession. Microbiology will be covered to include three classifications of bacteria, how they grow and reproduce, modes of transmission, and the diseases related to various strains. Additionally students will discover the difference between bacterial and viral infections. Knowledge of bacteria and virus transmission will aid your study of standard safety and sanitary measures.OSHA and MSDS will be discussed along with proper handling of hazardous materials and disposal of sharp instruments. This course covers standard precautions and introduction to HIV/AIDS and hepatitis. CPR\FIRST AID certification class will be provided. Preparation & setup will be practiced in the clinic. Students will learn how to greet clients and practice proper consultation dialogue. Additionally students will earn how to record, read and assess all related patient\client forms. Treatment indications and contraindications will also be discussed as well as ethical and professional methods of draping the clients. The clinic portion of this section focuses on European style facial techniques, correct cleansing methods, and exfoliation methods. The students will learn how to complete both the basic facial and the European facial. 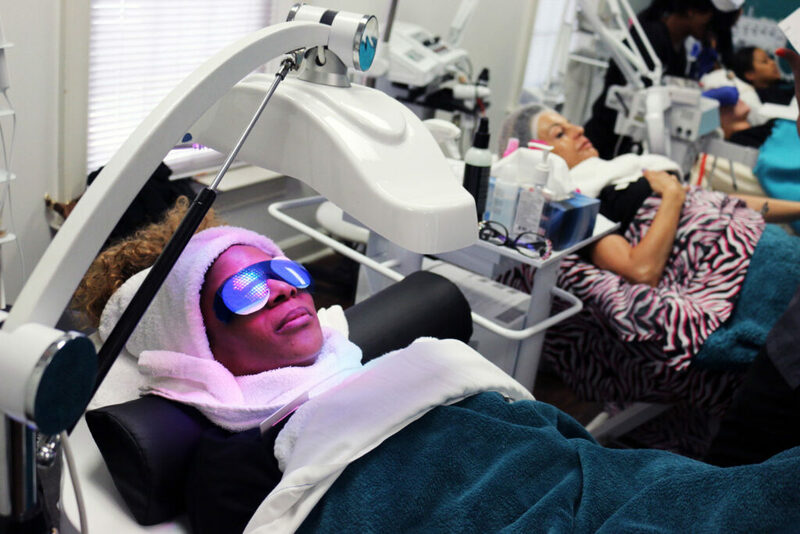 Students will also learn the correct products for treatments and skin types, as well as proper use of steam machines and hot towels. A complete and thorough skin analysis is the backbone to a successful skincare treatment. The students will learn to conduct a comprehensive skin analysis whereby they should be able to recognize skin types, skin conditions, Fitzpatrick, the Glogau and Gubin classifications and when to suggest further investigation by physicians. The students will understand the importance of not diagnosing disease but be able to recognize diseases and disorders and know when they are contraindicated to the facial service. Skin analysis will be demonstrated and mastered using both a magnifying lamp and the digital skin scanner and wood lamp. All aspects of clinical and paramedical esthetics are discussed in this level. The students will learn more sophisticated devices and electrical safety will be taught. The students will learn how these advanced electrical devices affect the skin. Chemical peels will be discussed and demonstrated. The history and science of chemical peels will be explained and how percentage and pH plays a role in selecting the correct peel for the client’s particular skin condition. The lectures will include both theoretical aspects as well as demonstrations on all electrical apparatus. All aspects of equipment safety and laws will be taught. We concentrate on chemistry and cosmetic sciences. Advances in the science of cosmetics have provided new techniques in response to the demand from clients and estheticians. As an esthetician you will be working with chemistry every day. The effects of cosmetics and skincare products are based on how the skin reacts to chemicals. To understand how different chemicals affect the skin, and to choose the correct products and cosmetics for each client’s skin type. Students will engage in learning the art of makeup to include color theory, set-up procedure and client consultation. The application of makeup will be studied and practiced. Basic makeup, evening, special occasion and bridal applications will be explored. Corrective makeup is taught for the purpose of camouflaging post-operative bruising, scars and pigmentation disorders. Temporary and semi -permanent eyelashes, lash and brow tinting will be demonstrated. Students will learn the structure and function of the pilosebaceous unit and its substructures. Morphology and types of hair will be covered in this course. Related diseases and disorders that affect hair growth will be discussed. Students will learn the contraindications to waxing services. Universal precautions will be discussed and practiced as well as correct sanitation and disinfection methods. 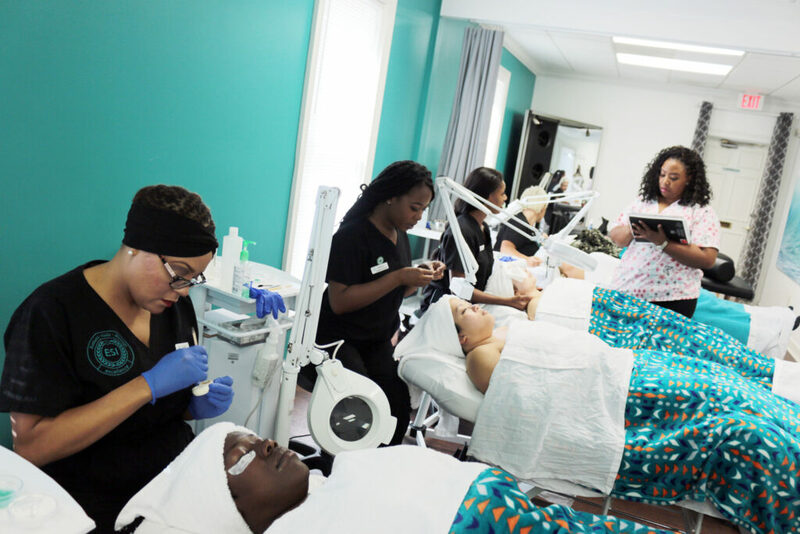 Students will learn the protocol of hair removal through tweezing or waxing with the use of hard and soft wax on numerous faces and body parts. Brow shaping, Brow design, Lash and Brow tinting will be demonstrated and taught. Additionally, the theory of other methods of hair removal such sugaring and threading will be explained. Laser physics and safety will be discussed. The products estheticians use are the lifeblood of the facial treatment. Estheticians need to know about advanced ingredients and treatments. The skincare industry is a multi-billion dollar industry of which we are a part of. As an esthetician you will need to know a wide spectrum of skincare products, how they work and how they are used. You will need to make decisions about products and how they best suit your client’s skin type and skin condition. Knowing product ingredients and the sources they are derived from is important to your success as an educator and a resource to your clients. Emphasis is on professionalism during this course while students engage in the learning of the business side of the service-orientated spa industry. Career opportunities will be covered and students will explore all the opportunities available to them as a licensed esthetician. Students will have an opportunity to develop a business plan, draw blue prints, and design an entrepreneurship, retailing, sales techniques, and how to build a spa business. The principles of resume and cover letter writing will be taught. Spa industry statistics will be discussed as well as liability insurance and risk reduction for the licensed esthetician. We investigate and learn about a holistic approach to skincare and skincare treatments. Understanding natural ingredients and different philosophies such as the eastern methodology of skin diagnosis is explored. Level three emphasizes professionalism, spa business, advanced skincare treatments and holistic sciences. The different career opportunities within the spa industry will be discussed. Students will have an opportunity to develop business plans, draw blue prints, create a spa menu and understand the importance of retail and sales. The principles of resume writing and cover letter writing will be taught. Spa industry statistics will be discussed as well as the importance of liability insurance and risk reduction for the licensed esthetician. Mock interviews will be held and facilitated by industry professionals to assist you with perfecting your interview style and prepare you for your transition from school to the work place. 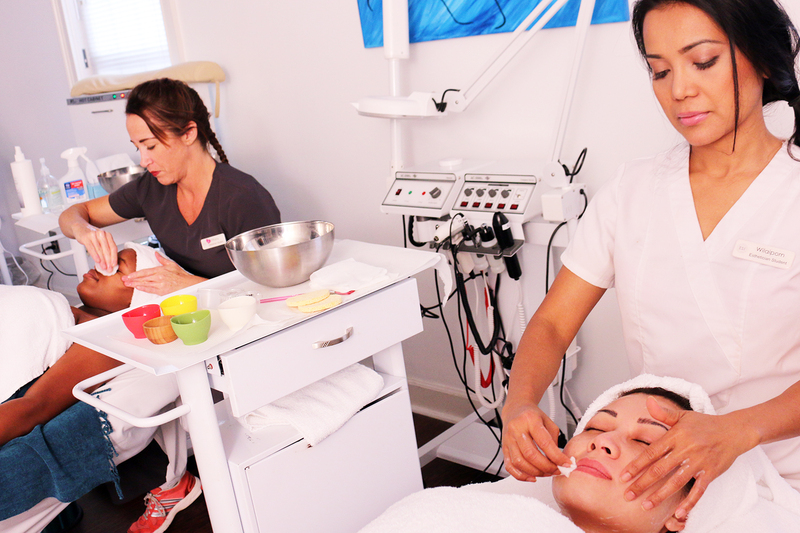 The products estheticians utilize in the treatment room is the lifeblood of the facial service. Estheticians need to know about advanced ingredients and treatments in order to stay ahead of industry trends. Understanding ingredients and how they affect the skin will be discussed at length. Recommending skincare products according to the clients’ skin type, skin condition and life style will be taught and demonstrated. Holistic Sciences will be introduced within level 3. The esthetician should look at the client holistically and utilize different treatment methods to assist the client in achieving their skin care goals. Reflexology, Ayervedic methology, hot stone treatments, lymphatic drainage, introduction to Chinese medicine, pressure point massage and many other alternative treatments will be discussed and demonstrated. A thorough understating of the basics of nutrition will be taught within this section to better guide your clients on adopting a healthy lifestyle. *When student has completed Level 3 requirements, they must pass an evaluation with a score of 75% or higher to graduate. The Pro artistry level will exceed your expectations regarding Hair Removal and the execution/technique of Make-up application conducted in a high-energy learning atmosphere. Hands on practical clinic sessions are facilitated by an educator who has in-depth knowledge and experience. Expert guest speakers that are industry leaders will provide pertinent information regarding camouflage make-up techniques & other various mainstream treatment trends. Waxing theory will include: hair removal using soft (strip) wax, hard (strip-less) wax, and other advanced hair removal techniques. Make-up and color theory will include: daytime, nighttime, special occasion, bridal and fashion looks; face shaping/contour; and brow shaping design techniques. Other theory and practical experience that is gained by the student are: lash and brow tinting & camouflage/corrective makeup. 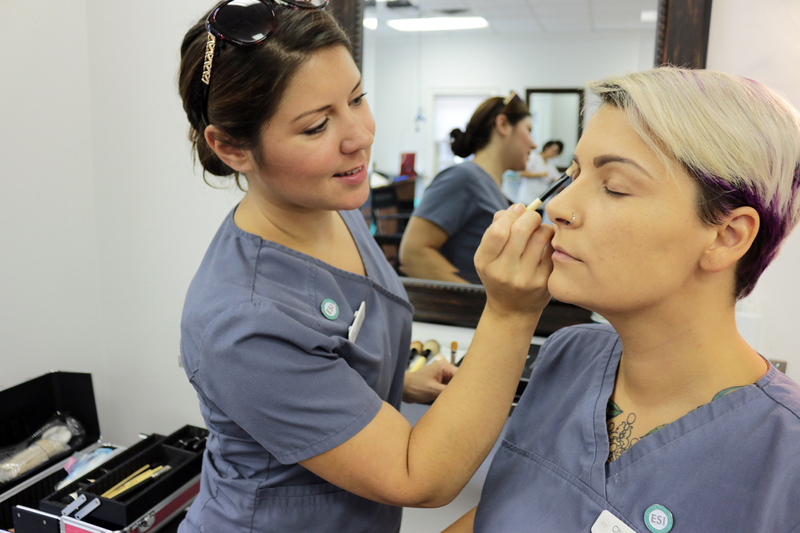 The Pro Artistry skills taught in our dynamic makeup studio classroom will prepare you for the high demand careers as a waxing specialist and makeup artist.